Q: What inspired you to start up the Deliciously Ella blog? Ella: I was a university student in St Andrew’s, Scotland, when in 2011 I became really unwell with an illness called Postural Tachycardia Syndrome. It affected my autonomic nervous system, which basically affected my ability to control a lot of the functions in my body. I couldn’t control my heart rate, my circulation, my digestion and my immune system. I spent months in and out of different hospitals trying lots of different types of medication. I really struggled with the physical side of it, but I also struggled with the mental side of being 20 and suddenly not being able to do anything and being stuck in bed. I really struggled with depression and isolation. I hit my rock bottom and realised that I needed to do something to help myself. That’s when I became interested in diet and lifestyle and how it could support the medication and help me to get better. I also knew that I needed to find something to do with my time other than watching terrible TV all day! So that’s why I decided to start up a blog where I could document my journey. Q: What changes did you make to your diet in order to improve your health? Ella: I resolved to start cooking more, getting my five-a-day, eating much more home-cooked food with plenty of fruit and veg and really focusing on that. Q: What improvements did you notice in your health once you had made these changes? Ella: Well it was a really slow process. It took about two years to feel like I was stabilising but I noticed improvements and after two years I came off the medication. I felt like I could do most things again. Then after another year and a half I felt like I was in a really good place. It’s still a question of managing my condition. I do have the symptoms under control now and I’m able to do all the things I wasn’t sure I would be able to do. Q: How would you describe your philosophy when it comes to food and living a healthy lifestyle? Ella: I looked at the idea of eating healthily and I kind of assumed that it was just all about diet food like iceberg lettuce and grated carrots. That was super depressing for me and everything that I didn’t want it to be. So I wanted to change this perception and make it about celebrating food and enjoying food and trying to share recipes that people would actually make. Q: When you first started the blog did you ever dream that it would turn into the huge success it has become? Ella: Oh my gosh, never in a million years! Also I never intended anyone else to read it as the blog was a very personal thing. I didn’t create it with the intention of anyone reading it and certainly not creating a business from it. So there’s something very ironic and strange about what it’s become. But it’s been an incredible thing and it’s really helped me to turn something that was very negative into something incredibly positive. It’s introduced me to a whole world that I love and that I’m so passionate about. I never thought I would feel so passionate about broccoli! Q: You have recently published your third cookbook. Tell us a bit about it. Ella: It’s going back to the misconception that eating well is all or nothing and that you have to stay at home on your own meditating and massaging kale. I wanted to create something that was a lot more accessible and enjoyable. It’s showing people that healthy eating can be fun. There’s recipes for things like spicy potato cakes with a garlicky sauce and green beans, or an Indian feast with chana masala, aloo gobi and coconut rice. There’s also nibbles like little baked potatoes stuffed with cashew sour cream. Q: What are your top five favourite health foods? Ella: Oats are one of my favourite ingredients because you can make so many things with them like porridge, breakfast bars, granola and cookies with peanut butter. I also love avocado, hummus and sweet potatoes. I think the fifth one would probably be a very good mix of herbs and spices like chili, mustard seeds, turmeric, cumin, paprika, cinnamon and ginger. They can transform so many things. Q: Do you take any vitamins or supplements to support your diet? Ella: When I was trying to get my symptoms under control I worked closely with a nutritionist who helped me with supplements. I was on antibiotics for two and a half years so we did lots of work on my gut with the help of probiotics and I still take them now. Also my adrenals weren’t producing enough cortisol so we looked at that too. It really helped me. Ella: Yes, I find that exercise is a huge help with stress because it gives you time to clear your head. I find it really helps me to get into a positive frame of mind. I love spin classes and I love yoga as well. Q: You are one of many celebrities supporting Red Nose Day this year. Were you excited to be involved in this? Ella: Yes. It’s a huge honour because Red Nose Day is such a big part of British culture so when they asked if I wanted to take part I was really honoured. 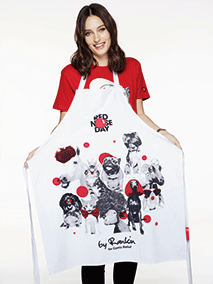 The HomeSense aprons were designed by the photographer Rankin and more than £5 from the sale of each one will go to Comic Relief. Q: What are the biggest challenges you’ve faced as a business owner and entrepreneur? Ella: I think one of the biggest challenges for me was fear; being nervous about putting myself out there and feeling quite vulnerable, knowing that people are going to make judgements. So, for me, on a personal level, that was a big thing to overcome. But you have to go for it, be brave and put a smile on your face. My husband Matt is my business partner and he does all the business development and all the logical, operational things, whereas I do the creative side. So teaming up together has really helped us to face all those challenges. Q: What is your top tip for healthy living? Ella: Find something that you enjoy. Find something you like and which feels realistic for you. Find more ways to enjoy fruit and veg and to get your five-a-day but, equally, lose the guilt if you want to enjoy a piece of chocolate cake. I think it’s all about finding a sustainable balance that will make you happy, day in day out, forever, rather than a quick-fix solution.